Dorset is a good choice of county in which to play chess! Over 300 players regularly take part in club matches and competitions. There are 2 leagues – the Bournemouth & District Chess League (B&DCL) and the County League. Results from the leagues can be accessed via the ECF LMS (League Management System) – click on the red button on this page, top right. Otherwise current chess news is posted on this website. In July and August 2016 the 103rd British Chess Championships were held in Bournemouth. 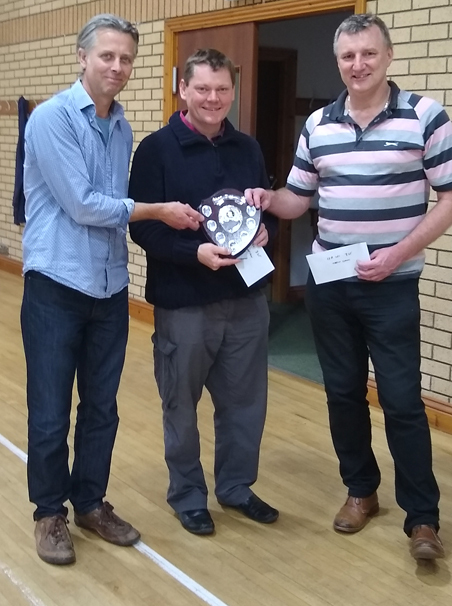 This was very much down to the considerable work of Dorset County Chess Association officials Martin Simons and Ian Clark. Clubs across the county also provided essential financial support. The 24th Dorset Chess Association Rapidplay will use the new grades which are due at the end of Jan ’19. And, as per last year, a very small number of “L” grades may be updated, in County & B&DCL, if they become “A-E” grades. ECF “F” grades are similar to our “L” grades and would be discussed with the club or clubs involved to decide which is the best or fairest grade. A reminder will be given at the end of Jan ’19. In the position below it is black to move. What would you play? Try and spend about 10 minutes analysing. This is taken from a fascinating NewsKnight article 20 years ago written by Martin Simons. Martin was trying to discover how players of different styles and strengths decide which move to play from a given position. He had a panel of 6 players from grade 108 to 194. The full article, running to 7 pages, can be viewed by going to “How do Chess Players Think?” on the extreme left on the very top menu. Please click on a page to expand. Clicking again may enlarge more. On the 7th and last page, Martin summarises the 9 options that everyone considered. After a successful trial last season all County League & B&DCL results and current league tables appear on the ECF League Management System (LMS). Scores are actually entered by Captains, typically just after matches finish and most often with some comments about the match. Nick Stout (White) v Richard Ursell in a defining game at the Dorset Closed at Merley 1 July ’18. Richard, who went on to become Dorset Major Champion, has just played 7….Be7. Opening: French Exchange Variation. Alan Dommett has analysed this game under “Games” Main Menu, along with 1 game from each of the other 3 sections. In the above game Alan comments “The isolated d-pawn is, all too obviously, taboo (7…Qxd4?? 8.Bb5+) making 7…Nc6 the more natural developing move as it springs the trap, but Black knows this target will not go away and is content to merely safeguard his king as quickly as possible”. In fact, Alan’s comments became reality late in the game when the impending loss of the d-pawn played a key part in white’s later decision to resign. Many congratulations to all the successful teams! Both the B&DCL AGM at Southbourne 12 June ’18 & the Dorset County League 20 June ’18 voted to use LMS from the start of season 2018/19 as the system to record results, update league tables and give grading information. The current website will continue as of now, but it will not show 2018/19 results, league tables or grading updates. Niki was sincerely thanked for all she does for Dorset Chess, but it was explained that it was in the best interests of Dorset Chess to use the ECF system which has proved successful. The existing website, will news and events etc will very much continue as of now. Dorset has been one of many Associations and Leagues participating in Phase 1 of the ECF League Management System (LMS). This is, of course, running in parallel with the current system of results and league tables on our website. There is a link to ECF LMS, then click “Dorset”, on the very top menu. You do not need a password to view information, only to enter results. You will see the system allows for listing fixtures by club and other searches are also possible. In recent months, Phil Wallace, the LMS Project Leader for Dorset and our Grading Officer, has set up club captains to enter results themselves on LMS and this has been a successful and evolving operation. Subject to local consultation and agreement, it is proposed to use this software next season to provide the fixtures/results and league tables through an ongoing link from our current website. The B&DCL & County AGM’s in June ’18 will be asked to decide. We believe this has many advantages and reduces administration time considerably. But we would not run our own system for results and tables in parallel. As Malcolm says on the video link below, it is far quicker to enter a result on LMS than send an email. Many captains have said it takes only 2 minutes. The software is still being developed all the time so there will, inevitably, be future changes. Malcolm Peacock is the ECF Officer responsible for the LMS, especially its development. His video is aimed at all those who have been given access to LMS for the first time to enter results and runs for about 12 minutes. Phil Wallace is keen to get any feedback on whether current LMS users feel this might be helpful for anyone about to use LMS for the first time. At both the B&DCL AGM 12 June ’18 & the Dorset County League 20 June ’18, members voted in Time Increments for B&DCL Div 1 matches in season 2018/19. 1 hour + 30 secs a move for each player. And also agreed Time Increments can be used in B&DCL matches Divs 2, 3 4 & 5 provide both Captains agree in advance, and, of course, digital clocks are available. But this option will not be available 2018/19 for Dorset County League Divs 2 & 3. What does “Time Increments” mean? Does it make games last longer? Would players need to record their moves if time increments are used? For standard games, players are now required to record all the moves of the game even when they have less than 5 minutes left on their clock if the Time Increment is 30 seconds or more per move. This is clearly an important change, as when there are no Time Increments, FIDE rules state it is permissible to stop recording moves when a player has less than 5 minutes on his or her clock in a time period. The recording of moves in Rapidplay, of course, has never been required. Are time increments proposed for competitive chess in Dorset? Since this article was posted there has been interest in trialling Time Increments in both the Dorset County League and also the B&DCL. Discussions have taken place at Committee Meetings of both leagues. No decisions have been made and, in any case, approval would have to be given at the forthcoming AGM’s. But the option most preferred is to apply Time Increments with digital clocks across all Division 1 matches in both the County League & B&DCL season 2018/19. And to allow Time Increments to be used below Division 1 in both leagues, but only if both captains agree in advance and on a match by match basis. Chess is a great game for everyone! To view club details and make contact with secretaries etc, please see details by clicking on B&DCL & Dorset League on main menu above. Some clubs have websites and links to these are through the menu at the foot of this home page. This is a popular chess congress in a stunning location!